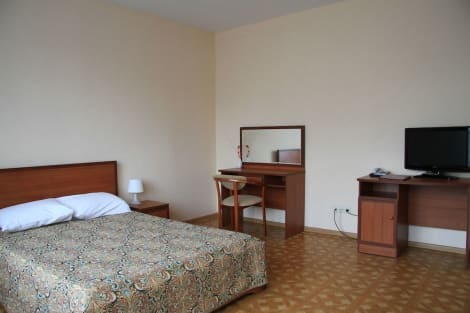 This hotel is situated in the north of Moscow. The property sits on one of the city's main highways, Leningrad Prospekt, which links Sheremetyevo International Airport within Central Business District. Guests can explore the many attractions that the city has to offer, including Tverskaya Street, the Kremlin and Red Square. The Palladium Shopping Centre, the Seven Sisters, Ostankino Tower and Petrovsky Palace can all be accessed from this establishment. This hotel comprises tastefully-designed rooms, which offer a peaceful space in which to work and rest in comfort. The property offers complimentary Wi-Fi, allowing guests to keep in touch with work and home, while away. With a stay at Cosmos Hotel in Moscow (Alexeevsky), you'll be within a 5-minute walk of Exhibition of Achievements of National Economy and Museum of Cosmonautics. This spa hotel is 5.2 mi (8.3 km) from Bolshoi Theatre and 5.4 mi (8.7 km) from Moscow Kremlin.